Fashion is in the air ! 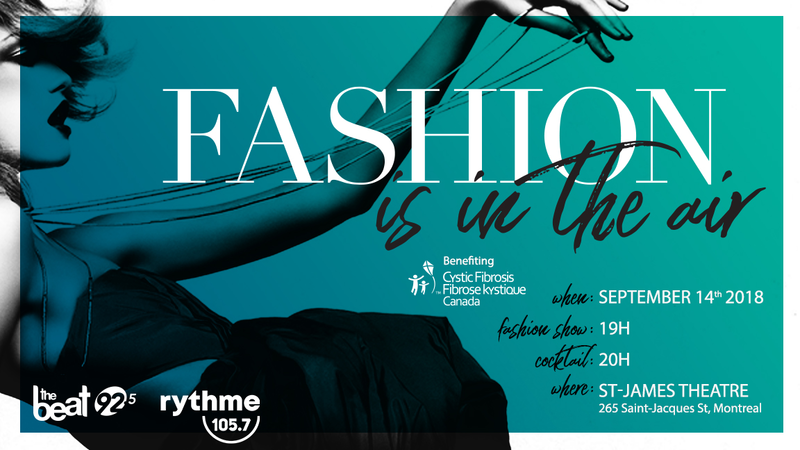 For more information about this event, please contact Fibrose kystique Canada at afauteux@fkq.ca. Thank you so very much for taking part in the success of the second edition of the fashion show Fashion is in the Air! Following the success of the first edition in 2017, the creations of some of Montreal's most prominent designers for men, women and children will again be presented on the runway by famous models and personalities. However, many surprises await you, as you join us on September 14th, 2018 at the St-James Theatre. The first edition of the fashion show raised $50,000 for Cystic Fibrosis (CF) Canada. We are counting on you to help us reach our goal of more than $100,000 on September 14th, 2018 at the St-James Theatre. These funds will be directly invested in highly promising research projects that aim to find a cure for CF, as well as support the 11 CF clinics in Quebec that provide essential care to the 1200 Quebec residents living with CF. Fashion changes with the seasons, but partnering with a world-class organization that changes the lives of thousands of people with cystic fibrosis will always be in vogue.